Al Zubarah Archaeological Site is a partly excavated coastal town that flourished due to pearling and trade from 1760 to 1811. It was newly built by Kuwaiti merchants just for that purpose. The town of about 5,000 inhabitants was mostly destroyed and abandoned after an attack by the Sultan of Oman 1811. It subsequently got covered by desert sands. The area contains remains of the town walls, port, cemeteries and fort. On my most recent trip in June 2018, I rented a car and drove to Al Zubarah in northwestern Qatar to visit its fort and archaeological zone, the Persian Gulf nation’s only inscription on the list of World Heritage Sites. Most of the site, which flourished as a pearling center in the 18th and 19th centuries, is buried under hundreds of years of desert sand, so I didn’t spend too much time in the torrid afternoon exploring the little that has been excavated, instead spending most of my visit inside the fort, which offered a shaded respite. To get to Al Zubarah Fort and the visitors center you can take bus 100 from Doha Al Ghanim bus station; the first one leaves at 9:30 am and it takes 2 hours to get there. There’s not any admission fee and all you can see is the fort itself, the small but informative exposition and the adjacent Qal’at Murair Archaeological site. One hour is enough to see all that and catch a return bus at 12:30. 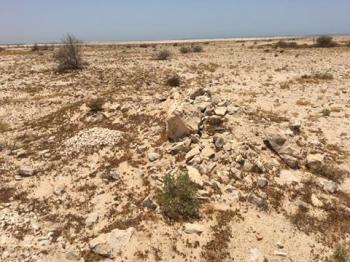 If you want to see the remains of al Zubarah city at the seashore, you have to prearrange the visit for the next day at the Museum of Islamic Art in Doha or at Tourist Information at the airport. Do not expect anything spectacular! Qatar is not one of these countries that are full of highlights and in other countries Al Zubarah certainly would not count as a highlight. But in Qatar it’s the only WHS and I found the first sign on the highway 75! km from the site. It’s about an hour driving from Doha. The fort is tiny. I rather qualifies as a bigger house. It’s currently being renovated, but work is almost finished. The interior serves as visitor center with information regarding the site. They also constructed a temporary exhibition close to the fort. I guess the plan to build a small museum there. The archeological site was closed for no reason. The only way to access it would be by car, as the territory is really big. But the pictures of the site showed me that I did not miss out on much. Despite the fort all was destroyed to the ground by the Sultan of Oman. Entrance is free. Destroyed during invasion: The attack on Zubarah in 1811 was followed by a short period of abandonment. Archaeological potential: "Excavation has only taken place over a small part of the site"
43 Community Members have visited.